US State Department spokesperson Heather Nauert has previously urged Turkey not to engage in any invasion of Syria's Afrin. According to Turkis DHA news agency, 20 buses with fighters from the Ankara-backed Free Syrian Army have crossed from Turkish Kilis into Syrian territory and are moving toward Azaz. However, no official confirmation has followed so far. An operation in Syria's Afrin has started "de-facto" with cross-border shelling, however, no troops have been deployed in the city, Turkish Defense Minister Nurettin Canikli said in an interview with the Haberturk broadcaster. — Dünya Gazetesi (@dunya_gazetesi) 19 января 2018 г. The minister noted that the operation was "right to self-defense in line with international law," adding that the country was conducting all necessary preparations for the upcoming operation aimed at destroying all "terrorist corridors." Turkey is consulting with Russia to bring closer approaches to the operation of the Turkish army in Syria's Afrin, the top official said, however, the Russian Defense Ministry has yet to comment on the situation. "We are preparing for an operation in Afrin, we are taking the necessary steps for this. We are coordinating with Russia and other interested countries of the region, their views should be brought closer to our position since this operation will ultimately be carried out," Canikli said. 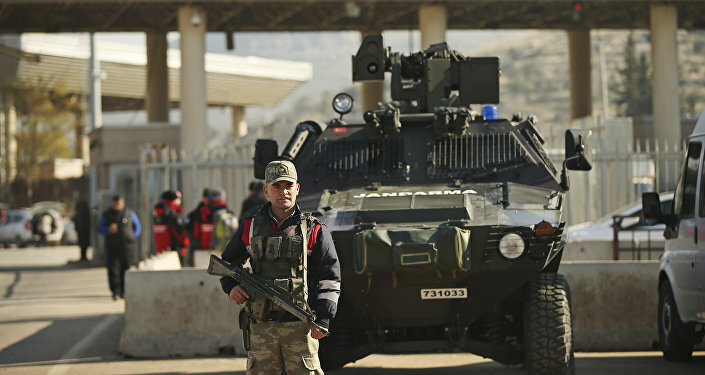 The statement comes amid a report by the Turkish Haberturk newspaper, saying that the Turkish forces were planning to use high-precision weaponry during the military action. According to the media outlet, the Turkish Joint Staff has reviewed the plan of the operation, leaning toward the strategy of conducting combat in urban settings. Turkish forces are reportedly planning to use aviation and missiles with laser aiming devices as, according to the command, the militants will carry out combat from organized defensive positions in quarters of the town. The newspaper further noted that the final decision on the use of the Turkish Air Force would be based on the results of a meeting between Turkish Armed Forces general Hulusi Akar and his Russian counterpart Valery Gerasimov. If Russia gives its consent, Turkish aircraft will be able to use the entire airspace above the town. Otherwise, the Turkish military will have to use laser-guided missiles and UAVs. Turkey has been threatening to launch an operation in Afrin since last week after the US announced its decision to start training a border protection force composed of the US-backed Syrian Democratic Forces, which has been described by Ankara as a "terrorist army." Turkish Deputy Prime Minister Bekir Bozdag said earlier this week that Ankara was holding consultations with Moscow and Washington over a possible operation in Syria's Afrin against Kurdish People's Protection Units (YPG), which Ankara considers a to be associated with the Kurdistan Workers Party (PKK). The minister further noted that Turkey considered US claims on the undesirability of a military operation in Syria's Afrin "empty and senseless." "We heard the assessment of the US State Department regarding the operation in Afrin. This is an empty and senseless claim, because the threat of IS [Daesh] is over," Canikli told the broadcaster. Turkish Foreign Minister Mevlut Cavusoglu said earlier in the day that Ankara would target the PKK, which is banned as a terrorist organization in Turkey, not the Kurds in general. On Thursday, US State Department spokesperson Heather Nauert urged Turkey not to engage in any invasion of Syria's Afrin. The remark echoed a statement made by US Secretary of State Rex Tillerson, who also assured that the US had no intention to build a Syria-Turkey border force, saying the issue, which has incensed Ankara, had been "misportrayed." However, according to the Pentagon, despite the fact that it is not a "new army," Turkey's security concerns are "legitimate." Damascus, in its turn, has vowed to destroy Turkish aircraft if they attack. "We warn the Turkish leadership that if they initiate combat operations in the Afrin area, that will be considered an act of aggression by the Turkish army," Deputy Foreign Minister Faisal Meqdad told reporters.